Following our article on our wide range of plastic safety steps, we’re moving on to our range of materials handling products. Sturdy, hygienic and durable, there’s a lot to be said this range, so let’s take a closer look. Every one of our trucks is manufactured from 100% food grade, medium density polyethylene, making them hygienic and resilient, even when cleaned thoroughly and frequently with antibacterial formulae. Our advanced rotomoulding processes ensure that the trucks are sturdy, free from weak spots (such as thinner corners and seams), and suited to your exact requirements – the trucks can be tailored to your exact specifications using our contract rotomoulding services, and come in a wide variety of vibrant, non-fade colours. Be made of appropriate materials and kept in good order, repair and condition, in a way that minimises any risk of contamination. Be made from materials that can be effectively cleaned. Not cause contamination by absorbing substances like food or cleaning products that can contaminate food. Free from unhygienic joints and seams, thanks to our rotomoulding processes, our plastic ingredient storage products fall in line with best practices for handling consumables. In addition, all the raw materials used in the production of our rotomoulded plastic ingredients products are certified as suitable for use in food storage. The tanks range from 30 to 455 litres, and can be purchased with loose-fitting lids and static or mobile frames for added support and ease of transport. All of our plastic tanks are manufactured from food-grade polyethylene, making them hygienic, easy to clean, and perfectly suited for use in the food industry. All of our plastic materials handling products are manufactured from UV-stabilised, food grade medium density polyethylene, offering customers superior quality standards and adherence to health and safety legislation for the food industry. 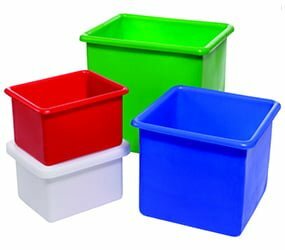 Available in a wide range of bright, non-fade colours, our plastic materials handling products is also available in recycled black polymer for an affordable alternative to our food grade polyethylene range. If you have a bespoke specification not available in our plastic materials handling products range, please talk to our contract roto moulding team for more information – we are happy to accommodate custom designs. Follow us @Excelsior_Roto for more of our news, or contact us today on 0161 765 2010 to talk about your requirements.